The Act on the Prevention, etc. of Child Abuse (Act No. 82 of 2000) provides for the prevention and detection of child abuse and measures to be taken after any child abuse is detected. Fig. 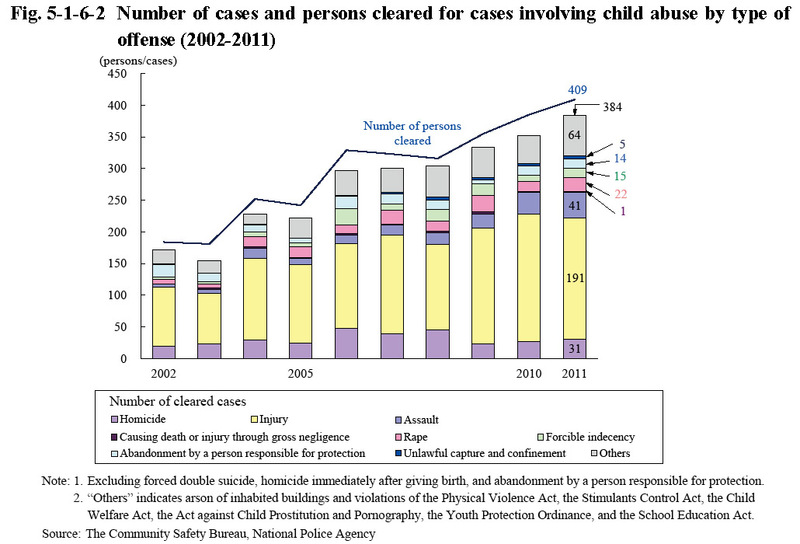 5-1-6-2 shows the number of cleared cases of and total persons cleared in child abuse cases (refers to cases cleared for acts of child abuse stipulated in the said act (abusive acts involving children younger than 18 by their custodians) as penal code offenses, etc. ; hereinafter the same in this subsection) by type of offense over the last 10 years. The number of cleared cases and total persons cleared was on a significantly increasing trend. 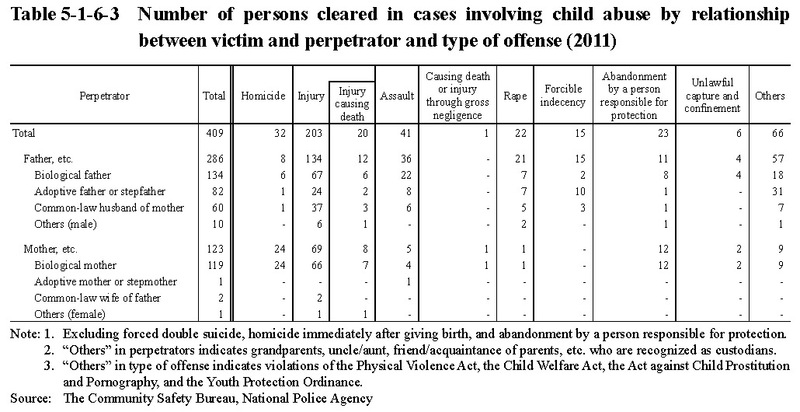 Table 5-1-6-3 shows the number of persons cleared in cases involving child abuse by relationship between the victim and the perpetrator (from the perpetrator’s position) and type of offense in 2011. Overall, the father, etc. accounted for the majority at 286 (69.9%) whereas the mother, etc. accounted for the majority for homicide and abandonment by the person responsible for protection at 24 (75.0%) and 12 (52.2%), respectively.